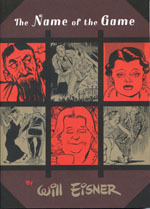 In this masterful graphic novel, comics pioneer Will Eisner weaves a darkly humorous tale off three Jewish-American families joined in wedlock: the old-money Arnheims, the more humble, midwestern Obers, and the upstart Kayns. At it's heart, the novel is a study in the disappointments of "good marriages". With characteristic irony and empathy, Eisner perfectly captures the subtle differences in class and culture between the families and the perils of a parent's best intentions.